This is our updated new wall-mounted bathroom cabinet, which is perfect for your compact bathroom, meanwhile adding a modern feeling to your bathroom. 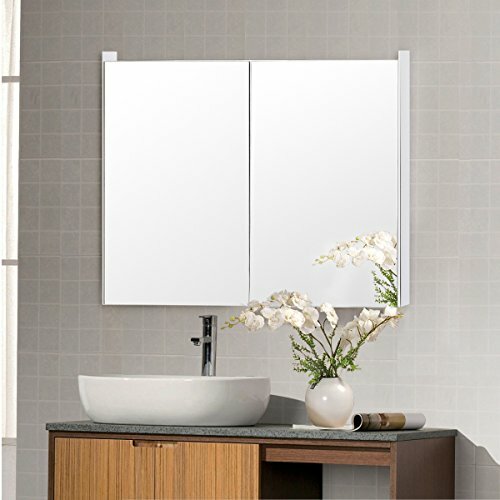 Made of engineering board, this bathroom cabinet is built to withstand a humid environment. On the door, there are two large mirrors, which can make your bathroom looks more bright and spacious. The two doors conceal the large storage area, which is divided into 2 shelves. If you have a suitable available space on the wall, you'll instantly add charming decor as well as critical storage space in the bathroom. Buy yours today! 【Modern Design】With a simple but stylish design, our bathroom cabinet is ideal for your rooms. It features enclosed shelf with double mirror doors, and one open shelf to place towels, soap, tissues and any other bathroom accessories. 【High Quality & Practical】The surface of mirror cabinet is spray painted, this surface can withstand a humid environment. The cabinet comes with adjustable shelves, which allows you to change the height to fit high bottles. 【Multifunctional】You can storage your daily bathroom item in this cabinet and you can also use this cabinet as mirror. Equipped with mirrored doors, you can make up in front of the cabinet and check your appearance before going out for work or date conveniently. 【Space Saving】This wall mounted bathroom cabinet is a perfect storage solution for your homes. Its design maximizes the space of your room. It can be assembled on wall or over the toilet, providing extra storage without taking up valuable floor space. 【Shipping & Customer Service】UPS or USPS will deliver the item to your house in 3-6 business days after you placed an order. We packed item as good as we can, if there is any damaged part, please contact us first and offer us pictures of damaged part, we will solve the problem as the way you want(discount or replacement).